Here’s a new twist on an old favorite – microwave salt dough Christmas ornaments. Just follow the simple recipe, cut out your favorite cookie cutter shapes, and microwave a plate of ornaments at a time. If you are looking for some fun, inexpensive crafts for Christmas, making ornaments with salt dough is a good choice. Basically, with salt, flour, water and some decorations you can make beautiful ornaments to give as gifts to family and friends – and you probably have these items around the house. This is an excellent craft for kids. My kids and I make this a tradition each year during holidays. We make them for everyone and now people look forward to getting one each year. You can also make these for any occasion. We have made them for Valentine’s Day too. ◊ decorations – glitter, paint, beads, etc. 1. Half of this dough recipe is enough to make all the ornaments shown, plus extras. You will also need paint in red, green, white, and gold, plus green glitter paint, and trims such as iridescent stars, pom poms, mini candy cane erasers, and glitter chenille stems. 2. 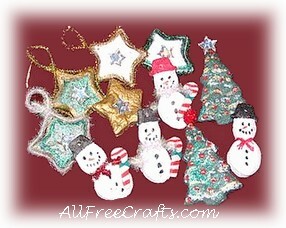 Use Christmas cookie cutters to cut a variety of snowmen, Christmas trees and stars. Use a toothpick to make a hole for hanging, being sure to make the hole a bit larger than you will want as they tend to close when baking. 3. Using a microwave-safe plate (not paper or cardboard), microwave a plate of ornaments for 1 to 4 minutes, increasing the time by 1 minute increments and keeping a close eye on the microwave as the ornaments bake. Microwave power levels differ, so use high power in a less-powerful oven, but lower if your oven heats things very quickly. You don’t want to risk a fire! Let ornaments cool completely before decorating. 4. Snowmen: Base coat white. Paint hats black. Use paint or markers for eyes, nose, mouth and buttons. You can also paint on a scarf, unless you are using chenille stems. Take one chenille stem and, leaving enough stem to form an arm on the left, wrap the stem around the neck, and form another arm on the right. Cut off excess stem and bend each end in a 1/4″ to form hands. Add mini candy cane erasers if desired. 5. Stars: Base coat white or gold. Add green glitter paint, or outline with gold paint or glitter paint, if desired. Glue an iridescent star in the middle of each ornament. Take a chenille stem and, leaving a little extra at the top to form half a loop, bend the stem around each star point, pushing in with your fingers until the stem will retain the star shape. You will find the stem ends at the top with some extra left over. Bend both of these end lengths together to form a hanging loop. 6. Christmas Trees: Base coat green, then re-paint with green glitter paint. Add gold and white accents in a “garland” effect, then use red to add red “balls” to the tree. Glue sparkly pompoms or two iridescent stars glued together on top of the tree if desired. Variations: These are just some possibilities for decorating microwaved salt dough ornaments. This is a good group project – just microwave batches of ornaments and provide paints and embellishments for creative activity. Properly dried the ornaments should last years. If you prefer to cook salt dough ornaments in a conventional oven, use our alternative salt dough recipe and directions for Halloween Cookie Cutter Creatures. For general information and recipes, see our Salt Dough Tips and Techniques Tutorial. i tried this recipe but the ornaments bubbled up in the centers did I cook them to long or do they need to rest in between each minute of cooking ? I’m wondering what could have caused this; it might be a combination of how big the ornaments were, how thick (or how thin) they were, and the power rating of your microwave. Mine were about a 1/4 inch thick, more or less, and I haven’t had this problem, even though I’ve done several batches over the years. The time for cooking them seems less to me now, probably because my microwave these days is more powerful than the one that I had years ago. this is great! but i am very scared that the creations will catch on fire but i dont want to put it on low and cook it for a long amount of time and waste electricity. what do i do? Hi, Ashylyn, I’m not sure how powerful your microwave is, but if you’re concerned about the risk of a fire then it’s best to work with a lower setting and a shorter time while you stand by and check the progress. Once you have a sense of what works best, adjust the microwave level and the time to best suit your needs. Because we’re only talking about short periods of time, it’s easy enough to remain by the microwave and make sure everything is safe.